Make your customer relationships a two-way street! 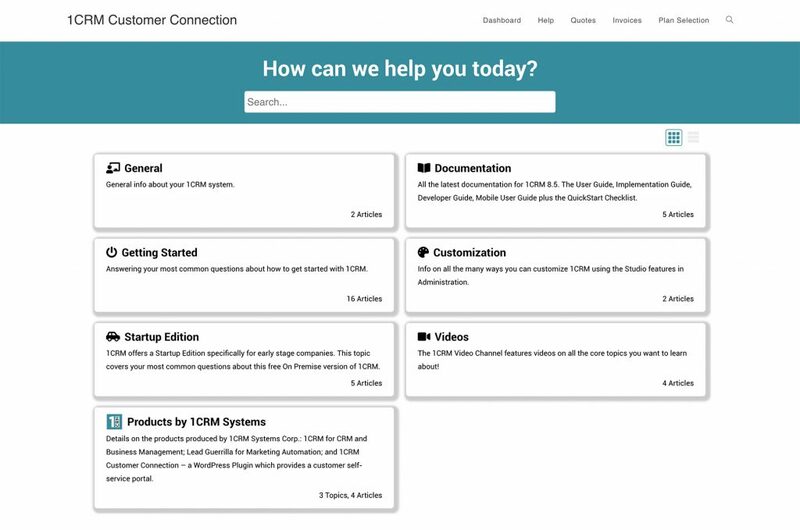 Increase customer satisfaction while reducing your support costs with the 1CRM Customer Connection self-service portal for WordPress. Enable your clients to find answers to their questions right when they want them. Empower them to update their contact information and preferences, exchange documents, and interact dynamically on Service Cases, Quotes, Invoices, Subscriptions and Projects! Simply install the 1CRM Customer Connection WordPress plugin (which links to your 1CRM core CRM system) onto your WordPress-based website, configure how you want to present the portal features to your clients, and your website will gain a wide range of features that enable your clients to work with you more easily and efficiently. Now your current website can double as a customer self-service portal! Portal visitors can navigate the Help system by clicking through Topics and Articles. Users can click in the Search box to enter their questions and receive dynamic feedback on matches as they enter their text. If there are Documents or Notes linked to Help Articles they will be accessible by customers in the portal. All the Articles are authored in the 1CRM Knowledge Base module. 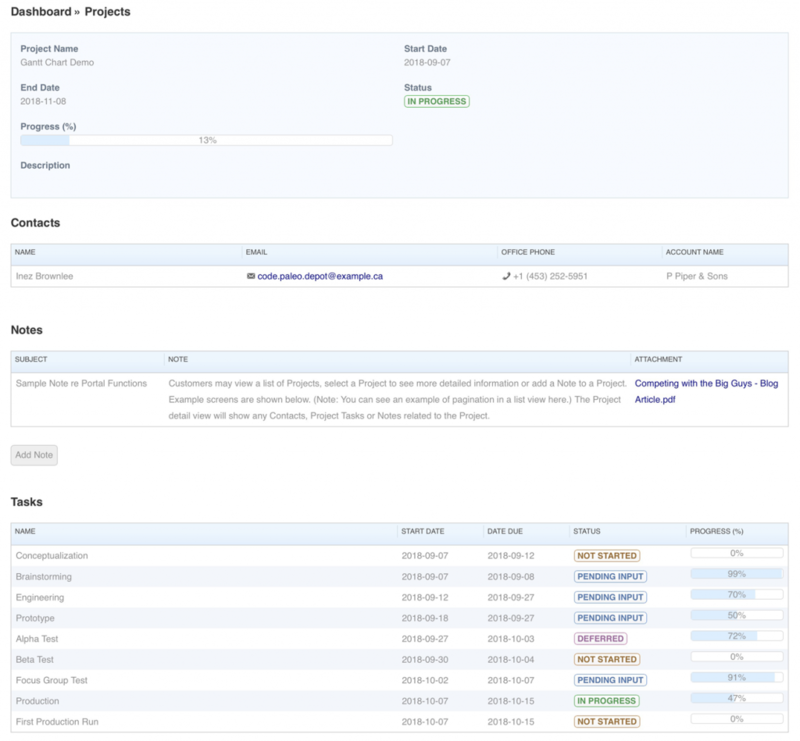 Portal users may view a list of service Cases, select a Case to see more detailed information, or create a new Case. The Add a Note button may be used to add a Note to a Case. Notes may include an uploaded file. Users may download file attachments from any Note linked to a Case. Users may also use the Create New button provided to add a new Service Case. Portal users may view a list of Quotes, or select a specific Quote to see more detailed information. The Quote detail view will show any Notes related to the Quote, and allows the visitor to download files attached to Notes. A PDF of the Quote itself may also be downloaded. Visitors may use the Add Note button to add a note to the Quote, and optionally may upload a file attachment with that note. For example, clients may download the Quote PDF, sign off on it, and upload it as an attachment to a Note. Portal users can see a list of all their projects, and a detail view of each, including any Contacts, Project Tasks or Notes related to the Project, and the visitor can download files attached to Notes. Visitors may use the Add Note button to add a note to the Project, and optionally upload a file attachment with that note. Clients may also review invoice and payment history, update their own contact information and data privacy preferences, manage subscriptions, as well as many other time saving features – with more in the pipeline! 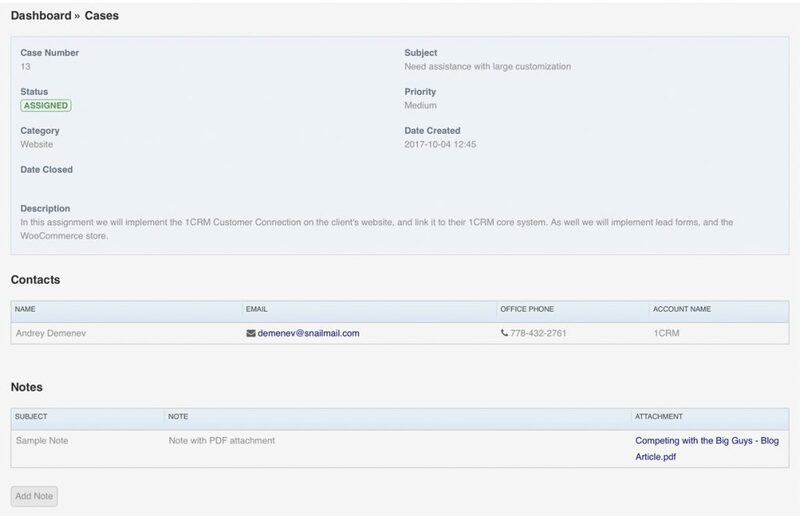 To purchase the 1CRM Customer Connection, you simply select it as option on your 1CRM subscription, either at time of initial purchase or by adding it on at a later date. You can implement this on your WordPress website by yourself using the User Guide, or you can have us do it for you. Either way it allows your clients to connect with you in the ways you see illustrated here. 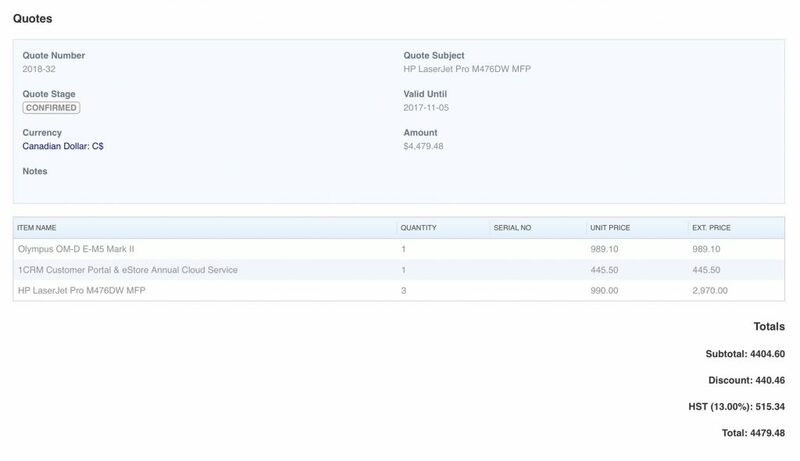 If you’re excited to get these kinds of capabilities working for your organization, read more here, or just drop us a line and we’ll demonstrate what it can do for you!